Once again we honor National African American History Month. I don’t think it can be argued that, despite the fact that we recognize the contemporary accomplishments of African American artists, such as Martin Puryear and Glenn Ligon, art historians still have a long way to go to integrate them into the narrative of “Western” art. I firmly believe that we should weave African American artists into the context of modern American art. For instance, I find this portrait by Samella Lewis as compelling as any of those by, for example, Elizabeth Peyton. This portrait by Lewis continues the tradition in African American art that expresses the poignancy and irony of the fact that the United States still has a long way to go in equal opportunity. In this sense, she does reflect the traditional view of many African American artists since the 1900s that they should portray the black community as it is: a proud reflection of their way of life. On the other hand, Lewis has isolated this boy against a stark background, perhaps suggesting the continued struggle of African Americans for mere acceptance as Americans. The emphasis on the book may be a clear reference to the fact that very few people, no matter what their race, can achieve anything in American society without a good education. 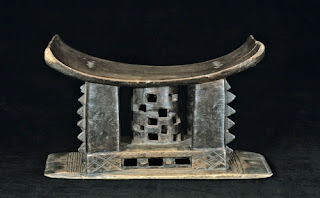 The curved bench on which the young man sits is possibly a reference to one of the great art forms of Africa, the stool. 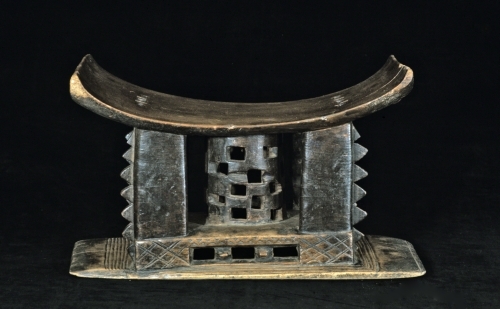 Asante People (Ghana), Chief’s Stool, 20th century. Wood, 48.25 x 21.6 x 29.21 cm (19" x 8 1/2" x 11 1/2"). Private collection. Photo © Davis Art Images. (8S-10518). Lewis was born in New Orleans and studied under Elizabeth Catlett at Dillard University. She attained her BA in art history at Hampton University in 1945. In 1948, she became the first African American woman to receive her doctorate in fine arts and art history at Ohio State University. Since then, she has written extensively on the contributions of African American artists, including the first anthology of African American artists’ writings in 1969. 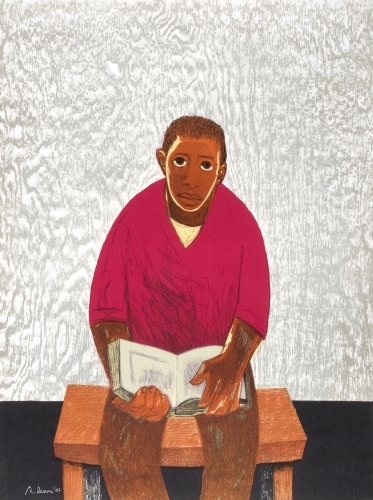 Her 1978 work “Art: African American” was the first survey of African American art. Lewis’ art often documents personal experiences in the black community. In Boy on a Bench, she seems to reflect her academic career and the possibilities she envisions for young African Americans. Studio activity: Paint a scene from your daily life. Plan your composition in pencil, depicting daily activities. They can be as mundane as going to the supermarket. Using markers, tempera, or watercolor, use dark and light values to create the illusion of three dimensions.